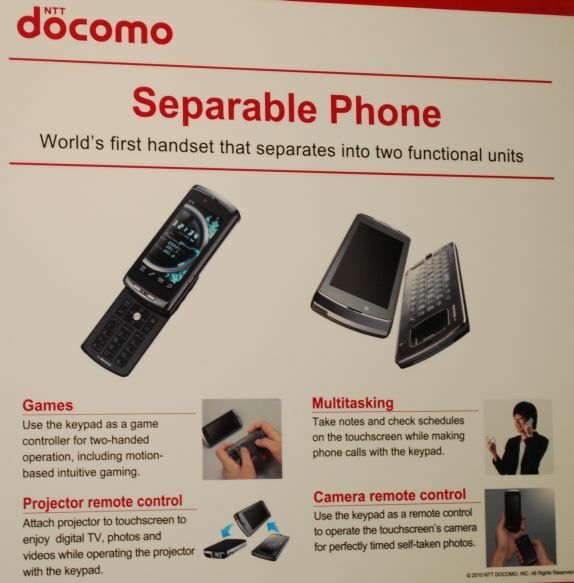 During MWC 2010 , NTT Docomo from Japan had something interesting to offer to visitors. We spotted the world’s first separable phone. Imagine being able to use one portion of your phone as controller for games. This phone takes multitasking to the ultimate level. You can take notes and check schedules on the touchscreen unit while making phone calls with the keypad unit. The separable phone utilizes Bluetooth for connectivity between the two units..You can attach a projector accessory to the touchscreen unit and use the keypad unit as a remote control for the projector. Doesn’t it sound cool ? Although this is a prototype , the handset is expected to go on sale in Japan.